~ Our blog for all things wine, beer, spirits, cigars … and more! 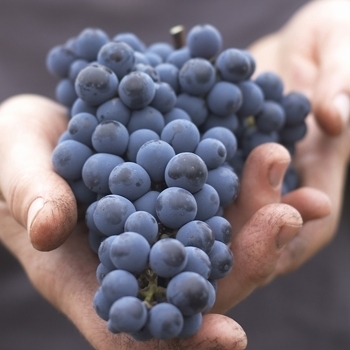 What inspired you to join the wine industry? You know, that’s a really funny question. I grew up in Los Angeles and if you had asked me what I was going to do, I would have said mechanical engineering. That was my plan until it was time to actually go to college. I went into business management, deciding I wanted to be the CEO of some business; didn’t know and didn’t care what kind. Then I moved to Washington and knew NOTHING about the wine industry. I was offered a job as a wine club manager which, after I figured out what it was, made sense with my business management background. So I said “why not?” That harvest, the winery threw me into the cellar to help out and I decided there was no way I was ever going to leave. Not only did it touch on the paperwork tracking/business side of my brain that I liked, but also the creative art side of my brain that I LOVE! Good news: as it turned out, I wasn’t half bad at it. The rest is history. Having worked in so many different wine regions of the world, do you have a favorite? I actually don’t. Every varietal grows so differently in every region that I have favorite regions for particular varietals and wine styles, but that is about it. Living in Washington, the Columbia Valley will always hold a major place in my heart but it still isn’t a blanket favorite. What is your favorite variety to make? To drink? I love to make blends. I look at it like painting. You get all these fantastic colors that on their own are gorgeous but then you get to see how they fit together and express your style. You end up making an art piece that is so different from everything you started with. Because of that, I love to try other winemakers’ blends. Through blends, you get an inside look at their true styles when they aren’t limited to a varietal or wine region style. However, if I’m sitting down for a glass of wine, it depends on what I’m doing or eating. Inside in the winter, curled up reading a book, I love a nice bold Cabernet. Outside on the patio, I’m grabbing that Pinot Grigio without hesitation. BBQ-ing, I’m leaning more toward a Chardonnay or a lighter Red Blend (I normally BBQ pork). When you’re not making wine, what do you like to spend your time doing? Anything and everything. I tend to have TONS of hobbies—some I’m good at, most I’m not—but I figure if you can’t laugh at yourself every once in a while, you’re not living right. I try to go on adventures with my friends like trying to find Mt. Rainier (unsuccessfully…it’s a long story), or hanging out at a local bar with my friends. I “Bloom” by painting and drawing. It was my first passion in life and something I will always do! In high school and college I took every studio art class I could take. My favorite past time is sitting on the deck (at my grandma’s house because I don’t have her view), looking over the river with a glass of wine in one hand and charcoal pencil in the other, headphones in my ears, and listening to music loud enough so that nothing else in the world existed but me, the wine, the pad of paper, and Mother Earth ahead of me! What is your general wine-making philosophy? Let the wine speak for itself. If you start with great grapes, you end with great wines, and I like to let the wine tell me what it wants. During fermentation, if you taste the wine every day it will tell you what to do. After fermentation, don’t fuss with it so much. Take a step back and let it happen. I’m a big believer in tasting your wines to figure out what they want, not relying on numbers like pH or sugar levels so much. That being said, you do have to look at some numbers, just don’t put everything in them. I like to think about it like this: when you make lemonade from scratch at home I’m sure you have a basic recipe with so much sugar, so much lemon juice, and so much water, right? But when you add all that in, do you just assume it is perfect and serve it or do you taste it? It’s the same idea: taste it and see what it needs. What are some of your favorite “wine moments” when you either discovered the magic of wine or gained a new level of appreciation for it? My first harvest I remember walking through the vineyards with the winemaker, absorbing everything I could possibly learn from him and tasting everything. I did not know ANYTHING about what I was looking for but I tried my best to remember and hold onto that information all throughout harvest. The next year, walking through the vineyards again and tasting things, all of a sudden I knew what he was talking about I could taste the differences in the grapes. I could taste and understand what most likely would stay and what would go away as the wine developed. I thought that was the most amazing thing ever! Every year as I walk through the vineyards tasting, I pick up more and it’s the most beautiful thing. I moved straight from Los Angeles to Prosser, Washington. And no, not for a guy. I did it all on my own accord. 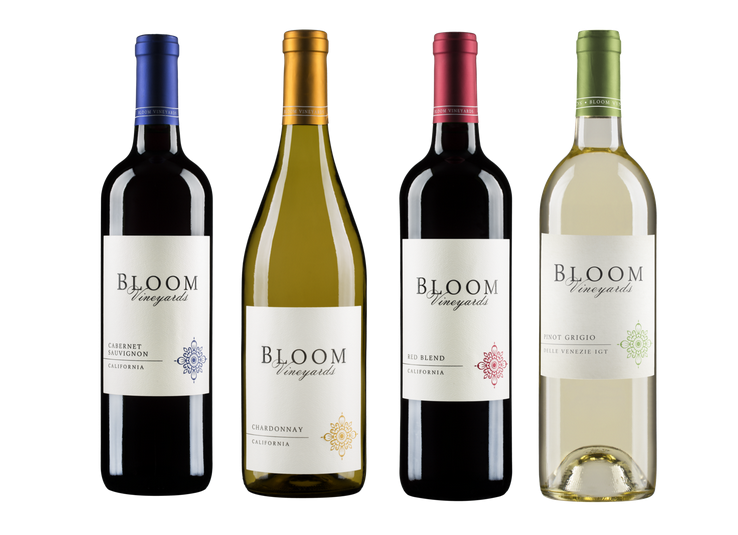 Which is your favorite Bloom wine from the current vintage and why? 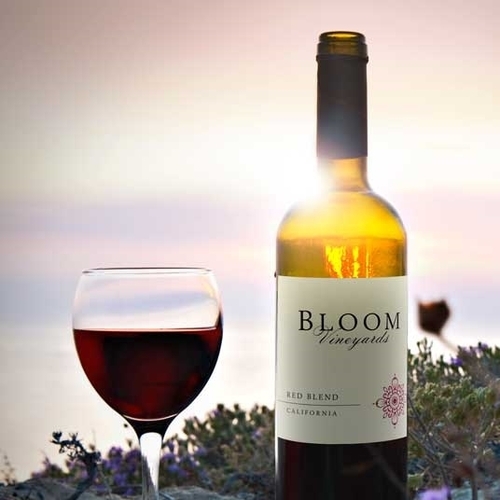 Outside with my friends and/or family on a gorgeous summer day, nothing beats a chilled glass of Bloom Pinot Grigio! Between the acid, fruit and clean crispness of the wine, you can’t go wrong. It goes with just about any food (especially a nice cheese plate) and is so easy to drink. Cheers! This is a continuation of our interview with Tony Abou-Ganim. Please read Part 1 here. Total Wine: We’ve been reviewing your new book Vodka Distilled over the past few weeks and enjoyed it very much. Why vodka? Why did you feel the need to come to its rescue and give this particular spirit a boost? Tony: Despite being the #1 consumed spirit by far in the US, I decided to write a book about vodka to give it the headlines it deserves. Bartenders, especially craft bartenders, have stuck their noses up to vodka. Though one of the oldest spirits in the world, vodka is misunderstood and not as well-known in the US as other spirits. Appreciation is on the way up, overcoming this true lack of understanding about just how versatile vodka can be. Total Wine: There are lots of vodkas and lots of cocktails in your Vodka Distilled book. Where does the intimidated reader start when wanting to do some mixing at home? Tony: There are not many classics with a vodka base. But the Frozen Mudslide took me back to the 1980s and specifically a time I spent with my cousin Helen in Cancun. Don’t over-think cocktails. Don’t put in esoteric ingredients. Just make delicious cocktails. How about you try the cocktail created for Dean Martin, the Flame of Love, which celebrates vodka. Dale DeGroff always used a grain-based vodka, specifically Finlandia, to make this great drink. Legend says that Sinatra liked Dean’s drink so much, he ordered 200 for the guests at Chasen’s in West Hollywood. That was not likely a happy moment for the bar staff, lighting that many orange peels. 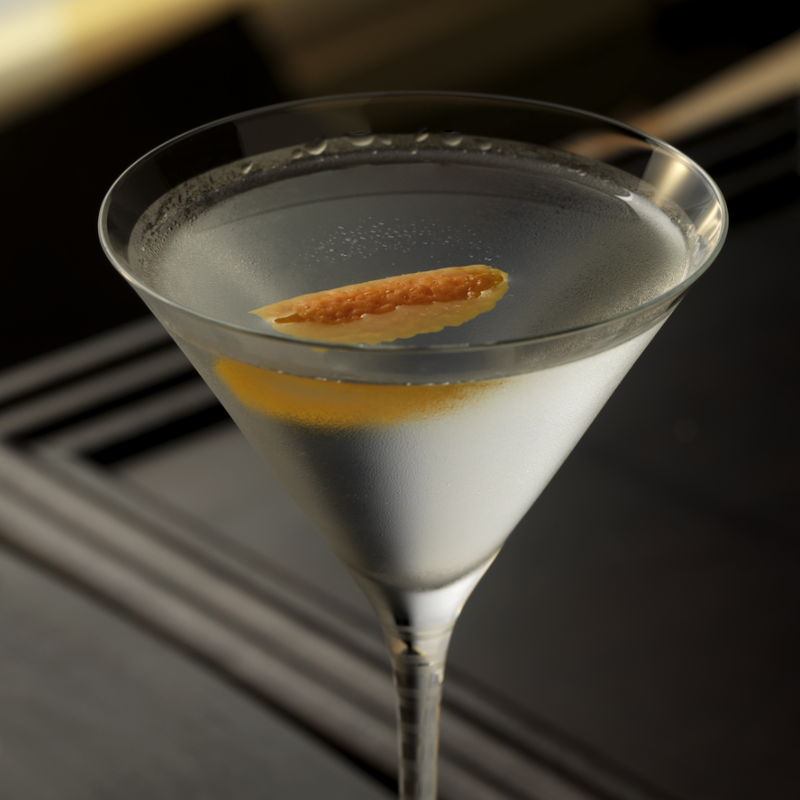 Or how about the Vesper, seen in Casino Royale. It’s this kind of drink that using vodka can be used to soften or stretch more intense spirits. Total Wine: When judging vodka, you taste it neat at room temperature, correct? Does it really matter when you’re mixing a cocktail, though? Does that flavor really show through in the mixed drinks? Tony: It’s about the “character” of the vodka! If you give me six Bloody Marys made with different vodkas, I probably can’t tell you which vodka is in that drink. I can probably tell you the character of the vodka used. Give me the six vodkas used first, and I will choose the best ones to compliment the drink! Total Wine: Vodka is having a resurgence now. Are there cocktails you hope tag along? How about cocktails you hope take a few years off? 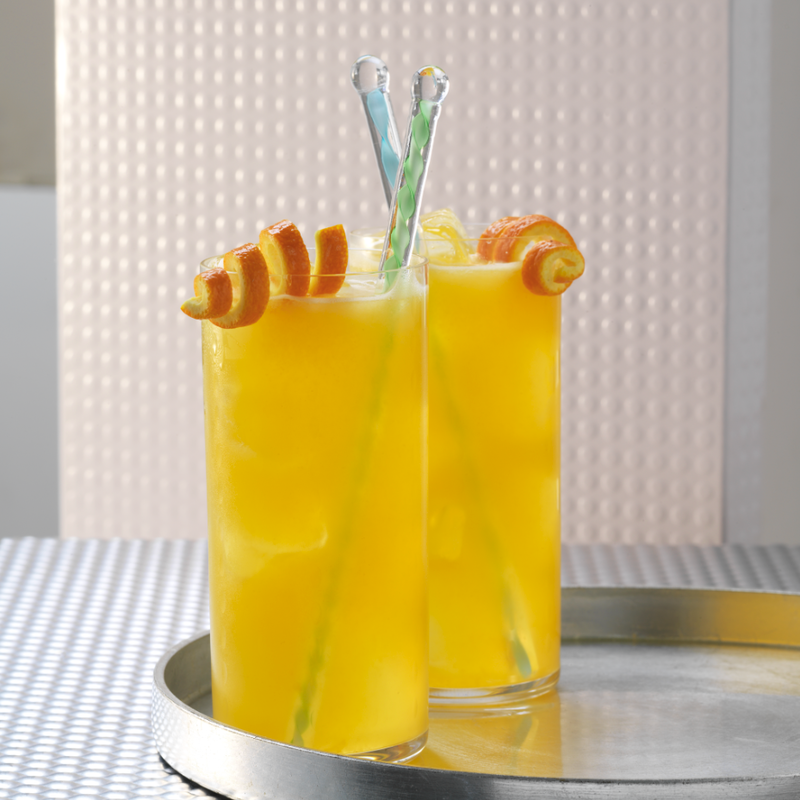 Tony: I’m hoping the Harvey Wallbanger makes a comeback. It’s such a great cocktail. The Sour Apple Martini, though–Thank God it seems to be dying off. Total Wine: How about Beer Cocktails and their recent surge in popularity. Have you experimented in making any yourself? Tony: I’ve tried it a little, but I think the movement will be short-lived. The amazing craft-beer movement has really impressed me. I’ve traveled the world loving new beers from Belgium to Germany. And don’t forget that part of being an excellent bartender is knowing about great beer. I just think adding beer in with classic cocktails is trying too hard to improve something that doesn’t need improving. Total Wine: Tales of the Cocktail is coming up next month. Will you be attending again this year? Tony: Actually, I won’t. I only missed the first year. It’s such a great event. But this year I will miss again, to launch a charity close to me. My cousin Helen David, who taught me a lot of what I know about bartending, was a two-time breast cancer survivor. She died at the age of 91 in 2006. This charity will support bartenders who are victims of cancer, and it is so important to me to be there! Total Wine: Are there new books we should look forward to? Are you on a three year schedule? The Modern Mixologist in 2010, Vodka Distilled this year in 2013. Tony: We are hoping to speed up the pace for our next book. This year’s book, Vodka Distilled, was received so well that it was nominated among four books for “New Cocktail Book of the Year.” We are very proud of this first book as it’s the start of a series of companion books to go with the original The Modern Mixologist. We hope to cut the time for new books with one focused on American Whiskey next in 2015 followed by gin and rum. Total Wine: Anything else you’d like to add to our conversation? Tony: Look me up next time you are in Las Vegas. We’ll taste some vodkas vertically to show the range they have with flavor profiles. I write to educate the consumer while not overwhelming them with information. Take time and experiment. We’re not curing cancer but we are making life more enjoyable! Total Wine: Thank you, Tony, for an excellent interview. Total Wine recently had the opportunity to speak with renowned bar professional Tony Abou-Ganim. Tony has appeared on (and won) three battles of Iron Chef America, made numerous appearances on daytime TV including the Today Show and Good Morning America, and is the author of two books, The Modern Mixologist and Vodka Distilled. (P.S. 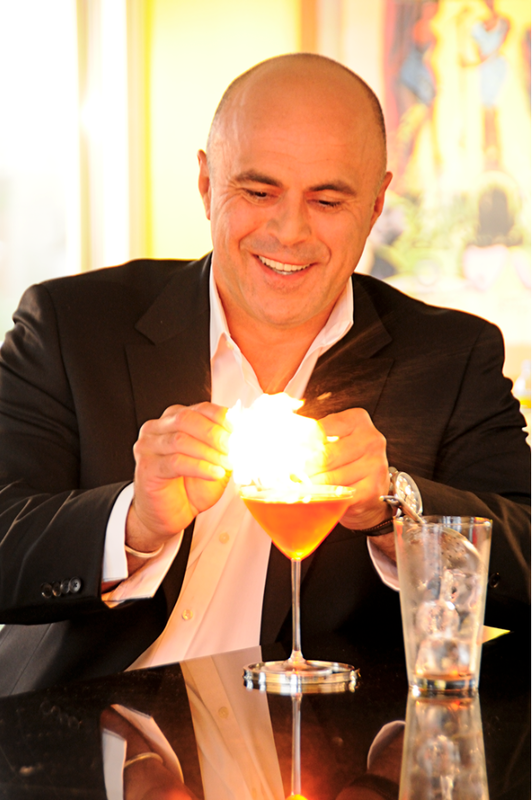 Tony will appear on NBC’s Today Show again this Thursday, July 4, 2013 at 7 am EST to do a cocktail demonstration; tune in!) He developed a specialty cocktail menu for the famous Harry Denton’s Starlight Room, worked as bartender for Mario Batali at Po in New York City, and developed the cocktail program for the Bellagio Hotel and its 22 bars. Tony is a winner of the Bacardi Martini World Grand Prix as well. Favorite Cocktail: Negroni. Thank you so much, Tony, for taking the time to talk to the Total Wine & More readers about your career and more specifically, bartending and cocktails. Total Wine: Have you ever been to a Total Wine? Tony: There’s one off Charleston at Boca Park in Summerlin (Las Vegas). I sent my nephew there today for some Everclear so we can make some homemade limoncello. I like the stores and selection. I’d actually like to do a demonstration there to help consumers that might otherwise be intimidated feel like they can create great cocktails in their homes. Total Wine: Can you tell us how the bartender that was schooled with traditional classics became known as “The Modern Mixologist”? Tony: That nickname is a play on words. I do have a foundation in the classics, but original ingredients are the new tool to make cocktails more modern. I’m still a traditionalist at heart. I think it’s funny that the term “mixologist” is so common today. 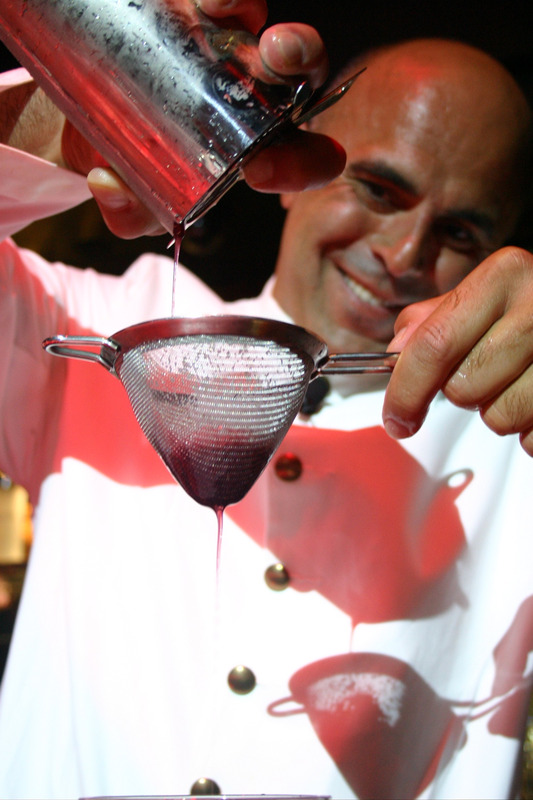 When I got my first promotion at the Bellagio, I helped create my title, Master Mixologist. The term, however, has roots in the 1800s, earned when a bartender learned to mix properly. Total Wine: You seem to be a stickler with the types of ingredients you use in your cocktails. Do you have a certain philosophy when it comes to what you put in your drinks? Tony: I do. I believe that you only get out of a cocktail what you put into it. And that the cocktail must be more than just the sum of its parts. I only use fresh, seasonal ingredients and believe in the integrity of the drink. I want people to make my cocktails. I use the classics as a starter since they have stood the test of time and try to make re-creating my cocktails simple for people to achieve. Total Wine: You’ve created many of your own cocktails over the years. Can you tell us about some of the famous ones and where you get your inspiration when getting behind the bar? Or does inspiration come in a dream? Tony: It’s been said that there will never again be a totally original cocktail. All new ones are based on the classics. So I start with great drinks and take license to imagine them in a different light. Take my Cable Car, for example. It’s a riff off of the Sidecar cocktail, where I switched spiced rum for cognac. But the Sidecar is itself a riff from the classic Brandy Crusta cocktail, an evolution of drinks. Total Wine: We know that you do a lot of presentations. We were wondering if presentations with fancy bottle tricks are common, or just the things you see in movies like Cocktail? Tony: Flair Bartending is a style that I have not practiced. If you’re good at it, I am not going to say it doesn’t have its place. But for me, performance is the flair, the techniques are the tricks. I want to create drinks that are a culinary masterpiece and be the best bartender I can be. Total Wine: What predictions do you have for bartending as an industry in general? Would you encourage someone into a bartending career? Tony: This is a fantastic time to be in the industry, if you are willing to do your work and taste the different drinks and teach yourself about the different spirits. Taste the different vodkas and know how each will work when mixed. I recently judged the World Class Bartender of the Year finals by Diageo, both in the US and Canada. The biggest compliment was that the Canadian winner was flown to my home in Las Vegas for training and to learn techniques. I take the mentoring aspect as an obligation, to inspire and educate a new generation of bar professionals. Part 2 of our interview with Tony will be published shortly. This is part 2 of our interview with Ingrid Hoffmann. You can read part 1 here. Total Wine: How can alcohol be included in a “Lite” Cookbook? Isn’t that making a dieting mistake? 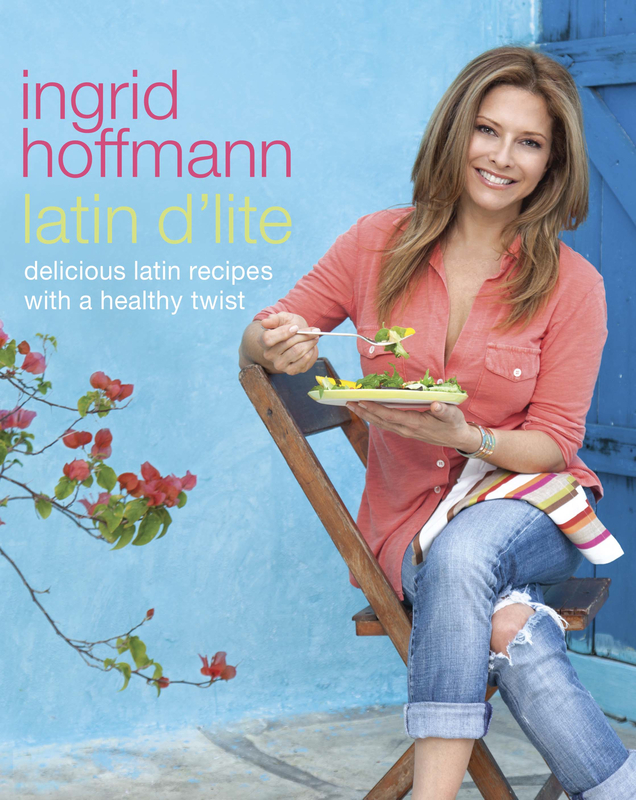 Ingrid Hoffmann: Latin D’Lite is not a diet book – it is the opposite of being on a diet! Diets are meant to be broken. Life is meant to be lived in balance and exercise is a key component of being able to enjoy your indulgences. If I know I am going to go to a party or dinner on the weekend with drinks then I add extra time to my work out or I am really good during the week so I can afford my splurge. Eating healthy does not mean depriving yourself of what you enjoy and that is why there are drinks and desserts in my book. It is about learning how to cut calories so that you can indulge here and there. Total Wine: We’ve seen you create punches, sangria, and a diverse variety of cocktails. Are you known for any particular drink recipe? Do you have a favorite spirit? How about a favorite wine and beer? Ingrid Hoffmann: I am known for my cocktails in general. People love my Blood Orange Tequila Beer Cocktail, Raspberry Passiontini (see recipe below) and Pink Caipirinha. As far as spirits, I love whiskey, rum, tequila, vodka, aguardiente and wine. I love Spanish Albariños for white wine, french pinks and Billecart-Salmon bubbly I adore. For red, a Vegas Sicilia, St Julien Léoville Las Cases. Total Wine: We’ve read that you are a fan of quinoa, using it in extensively in your cooking. Can you think of the perfect quinoa dish and adult beverage combination? Ingrid Hoffmann: I love quinoa and have various dishes using it. The Yellow Quinoa recipe from my book is a great side dish. I think it pairs well with an Albariño. Total Wine: Finally, what’s next for Ingrid Hoffmann? Will you start working on another cookbook? Are there any exciting surprises slated for your TV program? Can you share any secrets with us? Ingrid Hoffmann: I am launching my new houseware line “Delicioso” in August on HSN and retail nationwide in September or October, which includes lots of drinkware items. I do have many great projects in the works and hope to soon announce! Ingrid is quite active in social media. You can find her on Twitter, Facebook, and Pinterest. 2. 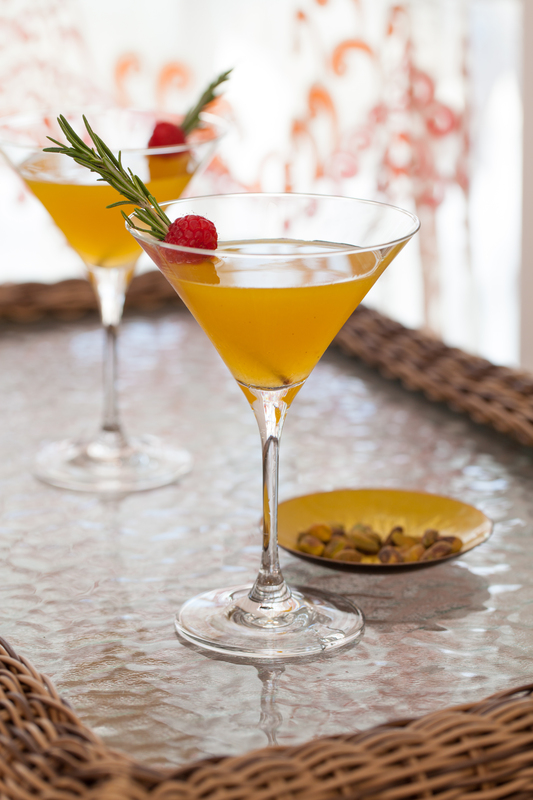 Shake the vodka, passion fruit pulp, and Rosemary Syrup in a cocktail mixer with ice until well chilled and combined. Strain into 2 large martini glasses. Top each with ginger ale. 3. Skewer each raspberry with a rosemary sprig (you may have to remove some of the leaves from the bottom of the stem to do so), and place a skewer in each glass. Serve immediately. We recently had the opportunity to speak with Ingrid Hoffmann, star of the Cooking Channel’s Simply Delicioso and author of the recently published cookbook Latin D’Lite. Thank you so much for taking the time to speak with us today, Ingrid. Reading your biography, we see that you have been a successful actress, luxury retailer, restaurateur, TV personality and writer. And though you’ve continued with some of those projects, it appears that you have been most passionate about cooking. Total Wine and More is interested in your career and learning more about how it relates to the combination of food and drink–your relationship with wine, spirits, beer and cocktails. Total Wine: Why cooking? Were your parents an inspiration for your culinary path? What is your earliest memory of cooking? 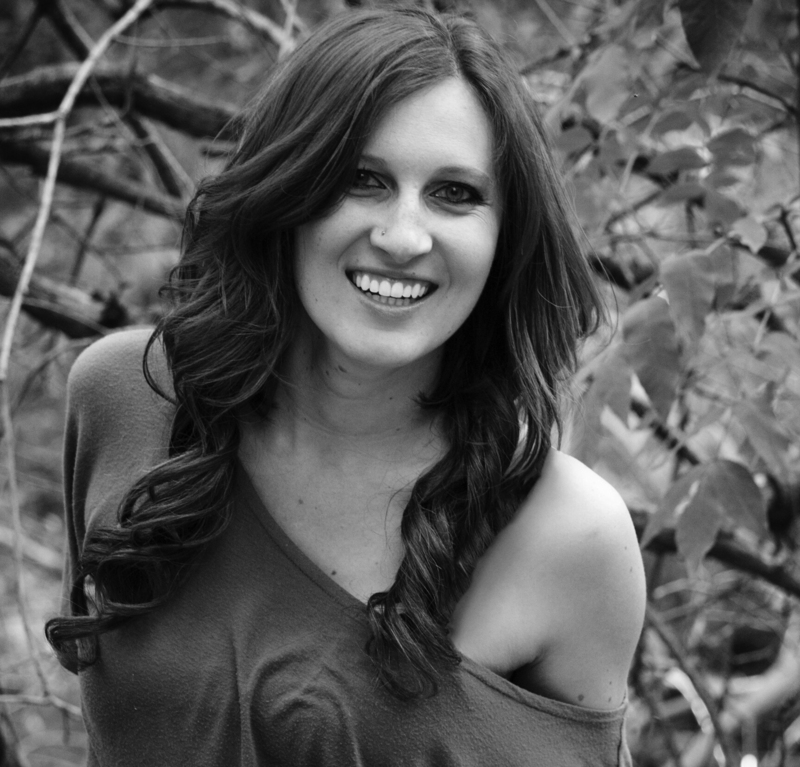 Ingrid Hoffmann: My parents were and are my inspiration. Mom was a Cordon Bleu trained chef that started her business from our home kitchen successfully expanding into her restaurant. Dad was an amazing cook and loved cooking. They did a lot of entertaining. My earliest cooking memory was during a Christmas. All the girls where in the kitchen cooking together: my two grandmothers, sisters and mom. We each had tasks, and I helped prep and make the three-meat stuffing for the turkey. Total Wine: Growing up in Colombia, is there a cultural cooking influence from there that shows through in your dishes? How would you describe your culinary approach? Ingrid Hoffmann: I would say, that from my Colombian side you see several influences, mostly the Afro Caribbean influence of cooking with fruit, mixing savory and sweet, cooking with Coca Cola, rum and citruses. From Bogota, you see the Andean peasant food made more modern. I also have Bolivian and Peruvian heritage and you will see that I live to use ingredients from those regions as well, like Quinoa and Peruvian chiles. I also have Basque roots and therefore there is a lot of Spanish influence in my flavors. Total Wine: You recently released your second cookbook, Latin D’Lite. Is there a specific theme that you are trying to showcase? Are you making appearances where someone can get a signed copy? Ingrid Hoffmann: The theme in this new book is to showcase great food, made lighter without sacrificing flavor. It is the anti-diet book! It’s about small lifestyle changes that add up to make a big difference. It is about living with balance with occasional splurges. It is how I cook for myself and eat at home, eliminating processed ingredients as much as I can. My food philosophy is about eating ingredients that came from the ground or had a mother. Yummy food from scratch done quick and creative and full of flavor. The publishing world has changed a lot and the way people buy books is not necessarily at bookstores, sadly enough I might add. We are mostly touring to promote it on TV and print nationally! As far as signings, we are doing them in combination with other events, like food festivals and book fairs. Make sure to follow me on Twitter @simplyingrid to find out about signings. Total Wine: The “cocktailicious — drink up your calories, chica!” chapter in your book tackles cocktails. Any favorite cocktail recipes you can tease the Total Wine readers with? Ingrid Hoffmann: I am not much of a sweets eater and therefore always joke that I’d rather drink my calories and I do mean that. I love a cocktail and I love my occasional Coca Cola as a splurge and as a treat. Stay Tuned for Part 2 of our interview with Ingrid, which includes one of her signature cocktail recipes! Total Wine & More Talks Vodka with Dan Aykroyd! Dan Aykroyd has worn many hats during his long and successful career – he’s an Oscar-nominated and Emmy award-winning actor, a writer, director, philanthropist, enthusiast of the supernatural, winery owner, tequila importer and now, vodka maven. Dan’s partner and veteran fine artist John Alexander has exhibited extensively in the United States and around the world. Together, they were avid researchers of the legend of the 13 crystal heads. And from this inspiration, an idea was born – Crystal Head vodka. How did you and John Alexander first meet? I met John back in my SNL days. Simply put – he stole my girlfriend. I was off doing a movie and when I returned to SNL my girlfriend at the time was dating John. But John was such a great guy we couldn’t help but to develop a friendship. 30 years later we are still great friends. As for the girlfriend, we aren’t too sure where she is nowadays. It must have been quite a challenge to find a manufacturer that could handle the specifications of John’s skull sculpture – how long did it take to find a company that could create his design? It took about 2 years to develop a mold for this bottle. We spanned the globe and no one would even try to do it. You have to understand no bottle company had ever done anything like this before so some of them didn’t even know where to start. As it turned out Bruni Glass was up for the challenge and after about 18 months or so and several attempts Bruni got it right. Of course, the eye-catching skull bottle drives a lot of sales, but a huge part of Crystal Head’s popularity is driven by what’s in the bottle – incredibly pure vodka. How did you achieve this amazing purity? The purity aspect was not easy. Because vodka is colorless and odorless people assume it must be pure. But in many cases it is far from it. Chemicals and oils are used to “smooth out” the product. As you can imagine I too was shocked to learn this. I was like everyone else. I believed vodka must be pure. When I found out that it wasn’t, it seemed natural to produce completely pure and clean vodka for people to enjoy. We did a lot of taste testing. The challenge for us was to produce a pure product yet still have incredible smoothness and mouth-feel and to have minimal burn on the throat. After a while of testing, it became apparent that the only way to make sure a product was to use very high quality water, and grains in our ingredient. The second thing we then did was distill it 4 times to remove any natural impurities that may appear from the distilling process and then we filtered it a total of 7 times. Many people think the number of times you distill the vodka is the most important thing. While it is important, filtration is also very important and of course the quality of your water. I had never heard of Herkimer diamonds before I was introduced to Crystal Head. What special properties do they contribute to the vodka? Herkimer Diamond is named for a Revolutionary War general and the stones come from a geophysically anomalous region of upstate New York. An area 50 miles by 50 miles has semi-precious crystals migrating from below the earth’s surface to fields and roadsides. We selected a basket of the finest stones available from a major harvester. These stones compose the contents of our final filter cone. The vodka after being poured through takes on a distinct platinum hue and resembles liquid satin as it goes into the bottle. It is our last touch to both ensure Crystal Head is the world’s cleanest and also it ties the bow, if you will, on our legend – that the Heads were given to man under mysterious circumstances for the purposes of enlightenment. Your family has had a long fascination with the paranormal — your father Peter even wrote a book about ghosts. What are your current “spiritual interests” or projects that aren’t vodka? Of course, I am always interested in any developments occurring in psychic research. My fathers’ book history outlines the depth of our family interests in these matters. Other than vodka my time is now focused on House of Blues where I serve as a founding consultant. We have a new initiative at all the clubs currently to re-connect with our respective communities. New Orleans and Chicago are the stars of this new policy. Check out part two of the interview here. Dan Aykroyd will visit Total Wine & More at our Norwalk, Connecticut location from 1:00 – 3:00 p.m. on Saturday, April 6th to autograph bottles of Crystal Head vodka. We interviewed Dan Aykroyd about the founding of Crystal Head, details behind its production and his interests in “spirits” beyond vodka. Anything new coming down the pike from Crystal Head? We have definitely thought about it. But there are so many things we still need to accomplish with Crystal Head that we really don’t want to lose our focus on another product when Crystal Head still has so much potential left it in. I’m sure you’ve had countless variations of cocktails using Crystal Head, any personal favorites? I am a simple guy when I comes to cocktails. Because Crystal Head is so outstanding, I enjoy it on the rocks with a squeeze of lime. I also really enjoy Crystal Head with fresh squeezed tangerine juice. That is really refreshing. I like keeping my ingredients pure, like the vodka. For years, the best post-consumption keepsake out there was the Crown Royal cloth bag. A cool crystal skull certainly beats that. What’s the most interesting use of an empty Crystal Head bottle you’ve encountered? Wow. That is a tough question because I think we have seen about a 1000 different uses for the bottle. Some disturbing and some very creative. I would say a fish bowl. I have seen a couple of fish bowls with our 1.75L Crystal Head. What about your previous experience/career as an actor and writer has helped you in your current venture into the wine and spirits industries? Certainly everything the feature film industry has taught me as a writer has helped. The original web introduction of Crystal Head was an example of concise and effective copy. At 2 million bottles sold people have connected both to the legend and to our double gold award winning fluid. A number of your movies have become classics and still have a devoted fan base, even among younger generations. How do you see your wine and vodka products being perceived in the future? To me it is about quality. I think trends come and go but if you make a truly great quality product it will stay around. Whether it is entertainment or consumable products if you don’t start and finish with quality you will never have anything that lasts. Part two of the interview will be posted tomorrow! Dan will be greeting his fans and signing bottles of Crystal Head vodka this Friday, February 3 from 4-6pm.